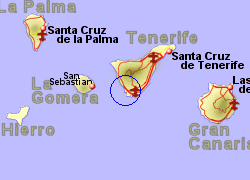 Map of the Playa de Las Americas area. 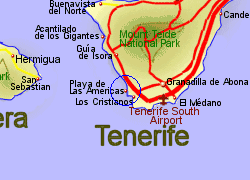 Located in Playa de las Americas, Apartment El Dorado offers a shared outdoor pool. 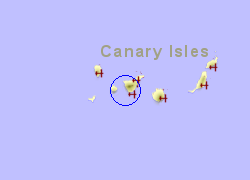 The property is at 300m from the sea and 2 km from Golf Las Americas. The apartment features a seating area and a flat-screen TV with cable and satellite channels. There is a full kitchen with a microwave and a refrigerator. The private bathroom has a bathtub with shower. Very well located this apartment it's set near commerce, restaurants, bars, etc. This 1 bedroom apartment with swimming pool is located in Palm-Mar and sleeps 2 people. It has WiFi, a garden and parking nearby. The apartment has one bedroom, one bathroom with a walk-in shower, a living room and a well-equipped kitchen. A flat-screen TV is also part of this apartment. This complex has a big swimming-pool, kids swimming-pool and two tennis courts you can enjoy. This lovely studio apartment to rent in the Port Royale complex of Los Cristianos, Tenerife offers very comfortable accommodation, a lovely sunny balcony and partial sea views. Port Royale has its own communal pool and large sun terrace with free sunbeds. The pool is heated in the winter. The complex has its own on-site restaurant and bar, with free wi-fi, and also has a launderette. A lovely apartment on the ground floor of the sought after complex of El Mirador that benefits from air on and a large sunny terrace. Set within the more exclusive end of Los Cristianos this apartment offers the perfect combination of peace and tranquility yet is only 10 minutes walk from the beach and resort centre for those who like it a bit livelier. Spacious and modern two bedroom apartment in Dinastia, Los Cristianos. Benefits from a spacious sunny terrace with sea views. Peaceful setting and only fifteen minutes walk from the resort centre. Set within the more exclusive end of Los Cristianos this apartment offers the perfect combination of peace and tranquility yet is only 10-15 minutes walk from the beach and resort centre for those who like it a bit livelier. A stunning, luxury 4 bed villa to rent in Tenerife with private heated pool in the Adeje region of Tenerife. This stunning 4 bed villa with private pool is definitely for the more discerning holiday maker. This beautifully refurbished 4 bed villa to rent in Tenerife has a large solar heated pool with stunning views and is all set within its own 4000 square metres of landscaped gardens! This stunning high quality villa is a must for the larger group and families. The villa is has been refurbished to a very high standard throughout and includes many high spec appliances.